Vast Public Indifference: Sealing Child? Does anyone know what the term "sealing child" means in the context of LDS baptism for the dead? I've found some good information about LDS baptism for the dead, but am having no luck tracking down "sealing child." Any ideas? It could mean that the child is being sealed to the family; when an LDS couple is sealed at marriage, any children born into that union are automatically assumed to be sealed to the parents, but if the sealing is done afterwards, children must be sealed in separately. For baptism of the dead, I assume the latter case would be more true, as if the parents had been sealed/LDS, the proxy baptism wouldn't be necessary. 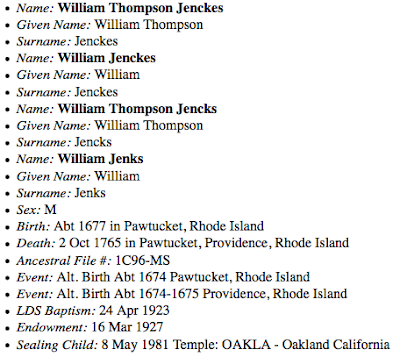 So is the 1981 ceremony sealing a descendant of William Jenckes, that is, connecting a child born in 1981 to his ancestors? Or is it a proxy sealing binding William's long-dead children to him? Or maybe binding William to his father, Joseph? Thanks for the help — I appreciate it. This would not be sealing a descendant to William, but (likely) sealing a child of his to him. I'm not a big fan of wikipedia, but this should give you the basics of the ritual. Because no other person is named on that line of the record, it is most likely his own sealing as a child to his parents.